One thing that we can be sure of on Friday is that Kate's wedding bouquet will contain a sprig of myrtle (known as the herb of love) from Queen Victoria's personal garden at the palace by the sea, Osborne House of Isle of Wight. Queen Victoria planted the sprig of myrtle from her wedding bouquet after her marriage to Prince Albert in 1840. Royal Brides have followed the tradition by taking a sprig from the same shrub that was planted over 170 years ago. 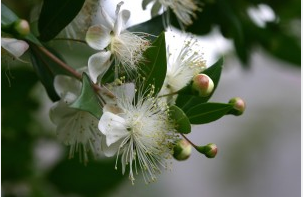 Myrtle is fragrant, has star like flowers with creamy white petals and beautiful dark green leaves. Did you know that Princess Diana's wedding bouquet was 4 feet tall? After the wedding ceremony, Kate's bouquet will be taken to the grave of the Unknown Warrior at Westminster Abby, a tradition that began in 1923 with Queen Elizabeth the Queen Mother following her marriage to King George VI.